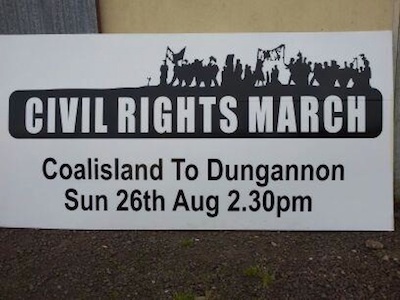 It has been 44 years since the first historical civil rights march from Coalisland to Dungannon demanding civil and human rights. I was proud to walk that walk as a young man. It is beyond belief that nearly all the injustices and denial of people’s rights still exist today in 2012 and that we have to march again for the same rights. The housing waiting list in the Dungannon area is more severe than 1968. The Irish Language Act has been binned with no consultation with interested parties. Unemployment is at record levels with immigration ri e among young people. Swingeing cuts of #4 billion have been implemented by the British government and meekly rubber stamped by a ser vile Stormont administration. Sickness benefit, disability living allowance, housing benefit to be slashed (under 25s to get no housing benefit at all) affecting the most vulnerable in society. Schools have been closed without consultation. Internment without trial has raised its ugly head again in the case of Marian Price. No jury Diplock courts; 28-day detention orders (it used to be seven days); brutality and strip searching of prisoners with a number still on a dirt protest. No inquests after 20 years for families. Supergrass trials are also given the green light again, which is totally wrong. There is not one acute hospital in the county of Tyrone and health cuts are taking place all over the nor th of Ireland. What are the MLAs from every party doing about all these abuses? Nothing it seems. House repossessions are also on the increase. A civil rights march will take place from Coalisland to Dungannon this Sunday at 2.30pm to highlight all of the above abuses of Br it ish government and Stormont neglect of t he ordinary citizen. We need to demonst rate that this will not be tolerated any longer. This march is non-party political and people from all religions and none are very welcome to attend. If you care, you will be there.